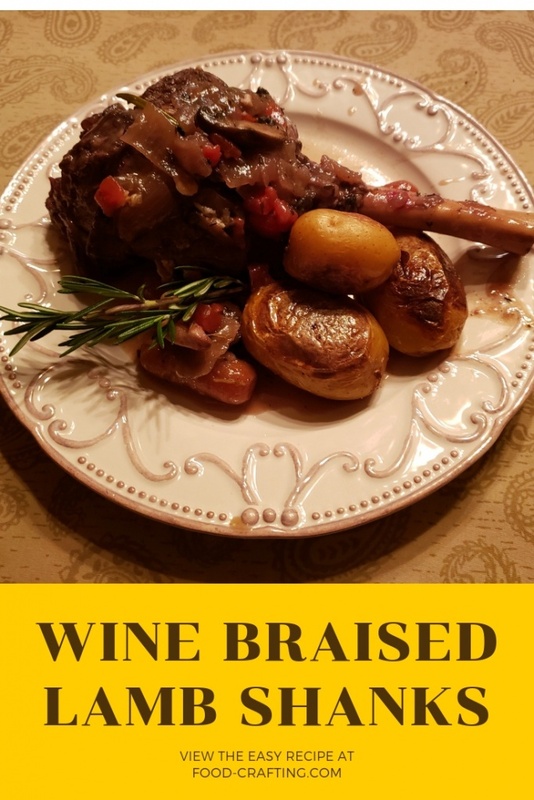 Wine Braised Lamb Shanks – Make Sunday dinner as easy as can be with this recipe for lamb shanks braised in a savory sauce enhanced with a generous amount of Cabernet Sauvignon. How easy? Prepare the recipe at your leisure on Saturday. It tastes even better the next day. 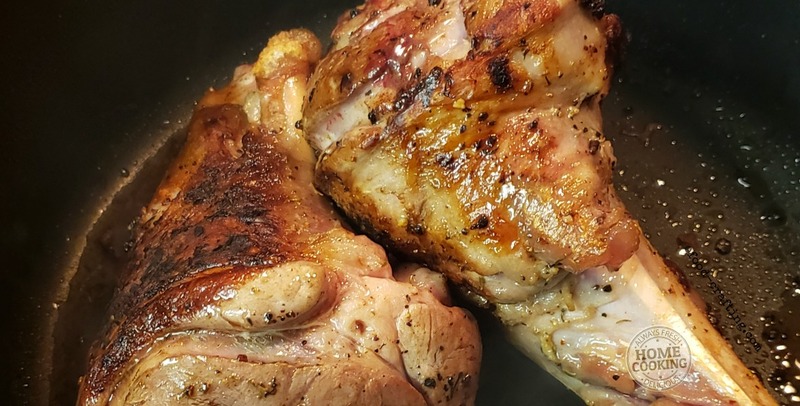 The slow cooking process tenderizes the meat to fall off the bone consistency. Add roasted or mashed potatoes and a huge salad. Voilà! Sunday night dinner was a success. The lamb shanks were unusually large but I could easily have served one per person! Everyone was hungry. Meditarranean flavors are predominant in this recipe. 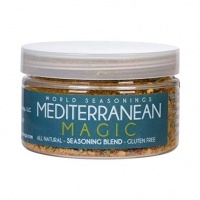 I always season lamb with Mediterranean herbs and spices even if the meat is roasted. Along with lots of garlic, the sauce is flavored with bits of tomato and sautéed mushrooms. This makes a flavorful sauce to ladle over mashed potatoes but it’s also perfect for sopping up with a slice of crusty baguette. Experiment with the layers of flavor. Omit the tomatoes. Don’t add mushrooms. These ingredients are all family favorites. We also love roast lamb shanks surrounded by white beans. The dry beans cook with the lamb in a broth flavored with garlic, rosemary and tomatoes. As the meat roasts, the pan drippings season the beans and cooks them to perfection. 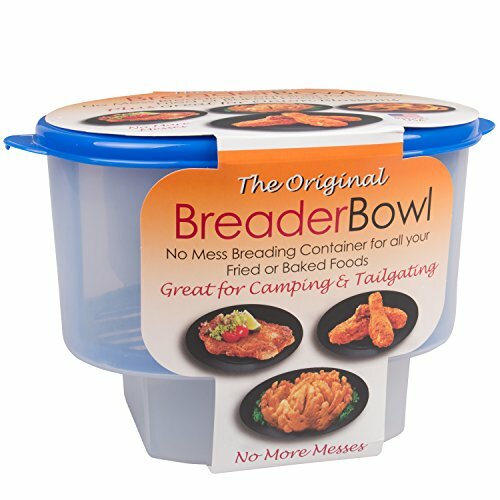 Might just be the next lamb recipe added to De’s Food Crafting. 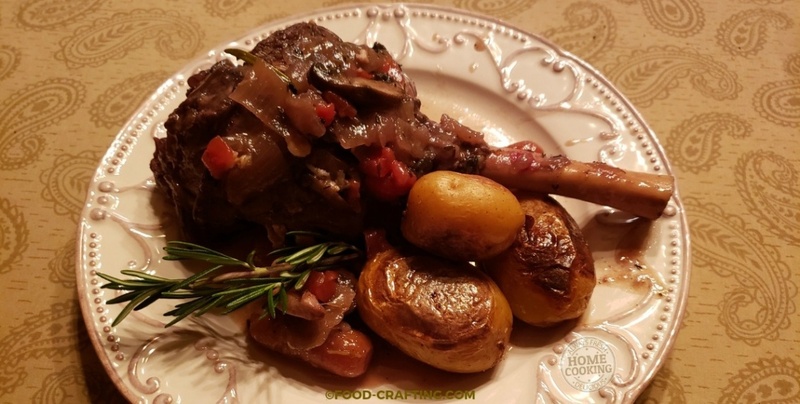 Fall off the bone tender lamb shanks braised in a red wine sauce seasoned with onions, carrots, mushrooms and lots of garlic. Serve with sautéed potatoes and a green salad. Pair with a Cabernet Sauvignon. 1 bottle or 3 cups of Cabernet Sauvignon - a small glass short of empty 750 ml bottle. About 14 oz or half a 28 oz. can of small diced tomatoes - spoon the tomatoes out in a slotted spoon. 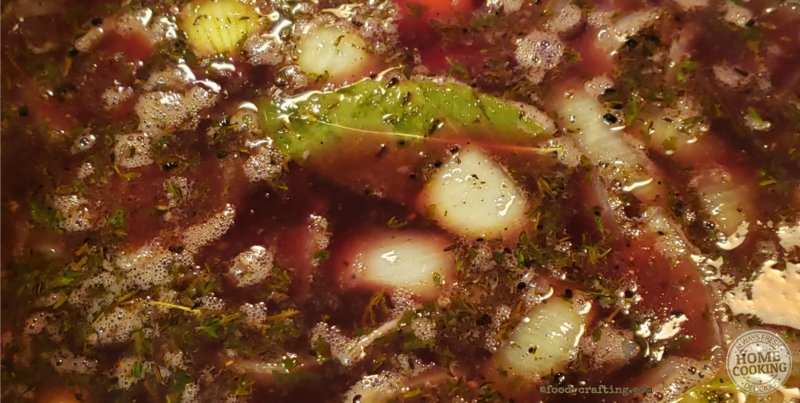 Lamb broth - 28 oz. 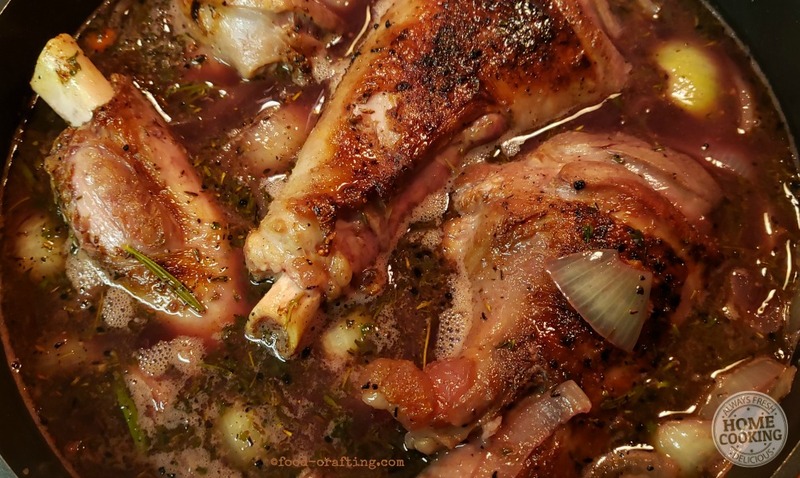 In a Dutch Oven, over medium high heat, brown the lamb shanks until seared on all sides. Set aside on a platter while you prep the veggies. 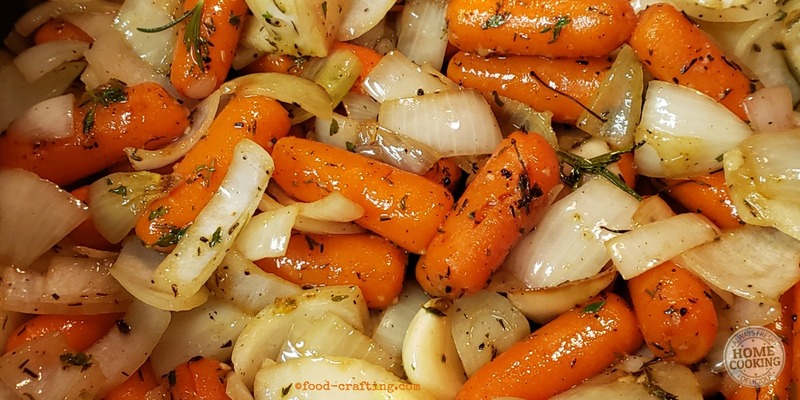 Lower the heat and add the entire bag of carrots, the chopped onions, the whole garlic cloves and the crushed garlic. Sauté for about 5 minutes then season with the fresh herbs. Stir to combine well. Spread the vegetables evenly across the bottom of the Dutch Oven. The mushrooms will be added the next day during the final recipe prep. Cover the vegetables with the broth then add the wine. Stir to combine. Carefully add the lamb shanks to pan, fitting them as well as possible and close to submerged in the wine and broth. They will shrink some as they cook. Simmer over low heat for about an hour. After 1 hour, adjust the position of the shanks so that they continue to be submerged. Cook for another hour or until tender. Bring lamb shanks to a simmer over low heat. In a small frying pan, sauté mushrooms in a tablespoon of butter. 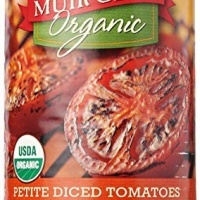 With a slotted spoon, remove approximately half the can of diced tomatoes and add to the sauce in dutch oven. When mushrooms are browned, add them to the dutch oven. Stir carefully to distribute tomatoes and mushrooms evenly through the sauce. Heat through. Lamb shanks are ready to serve. You can remove the meat cleanly from the bones or serve individual shanks. For a twist on the standard green salad with vinaigrette, consider adding some paper thin slices of fresh fennel. This adds another layer of flavor to your salad. Works perfectly with lamb. 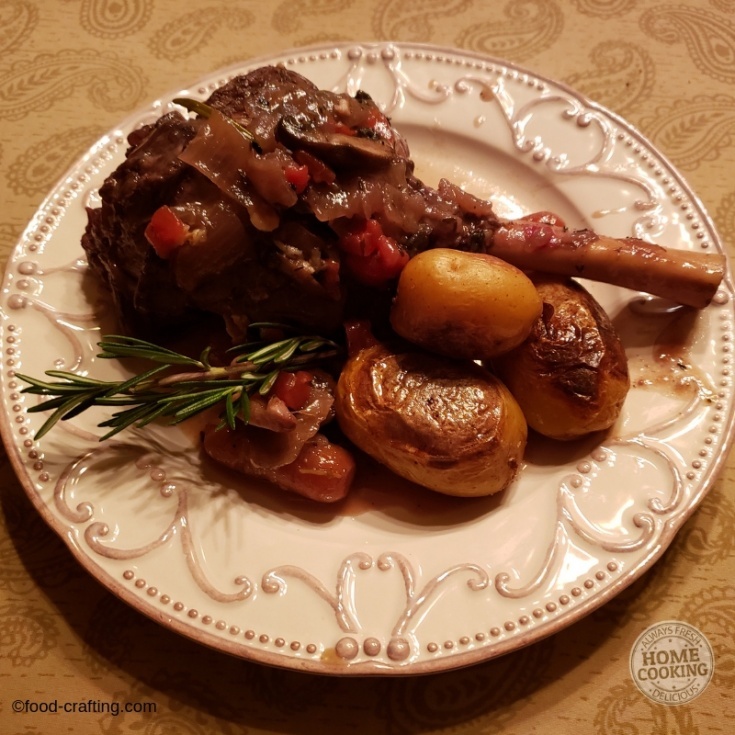 According to my Food Diary calculations, a serving (or 1/8th recipe) for the Wine Braised Lamb Shanks is equal to 802 calories. It does not match the calculations below. 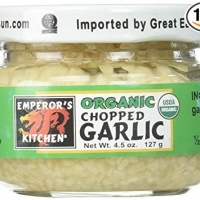 Emperors Kitchen Organic Chopped Garlic, 4.5 Ounce - 12 per case. It never occurred to me before to thoroughly read the nutrition facts on a bag of baby carrots. It was quite a surprise! A 16 oz. bag of baby carrots has 65 mg. of sodium. Calculate the sodium content of any recipe because it adds up very quickly. But carrots? I am not a sodium-restricted diet but do I have to also watch carrots? Just out of curiosity, I now want to add up all the calories, fat, cholesterol, sodium, potassium, carbs and protein in a recipe. We’ll start with this one. I’ve included the actual calorie count per serving in the recipe notes. Everyone needs to watch their sodium levels but too much potassium also has nasty side effects. “Consume less than 2,300 mg (approximately 1 tsp of salt) of sodium per day. It’s easy to adapt this or any recipe to fit a particular diet. 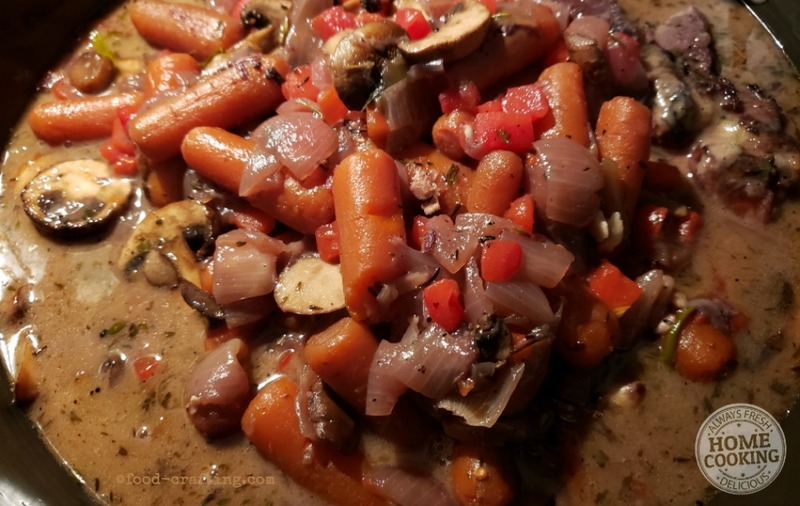 Simply re-write the original recipe with omitting certain ingredients, using different ingredients such as low sodium broths or replacing ingredients altogether! Print out a few simple recipe template pages to create a personal cookbook of Keto, Paleo or Whole30 recipes. You now have a ready made shopping list! 1.5.1 How Does It All Add Up?